A cervical encephalocele is a rare neural tube defect that presents as a skin-covered cystic sac protruding from the back of the neck. It results from herniation of neural tissue through a fusion defect in the posterior elements of the cervical spine. Contents of the sac-like protrusion can include occipital lobe, brainstem, cerebellum, and/or upper cervical spinal cord. Prognosis depends primarily on the size and contents of the encephalocele as well as associated syndromes, cerebral anomalies, and ease of surgical correction. Contents predicts outcome: Outcome depends on the amount and type of neural tissue within the encephalocele. Anatomy defines treatment: Appropriate surgical treatment requires a detailed understanding of encephalocele anatomy including the neural structures contained in the encephalocele, the arterial supply, and the venous drainage, which is frequently anomalous. 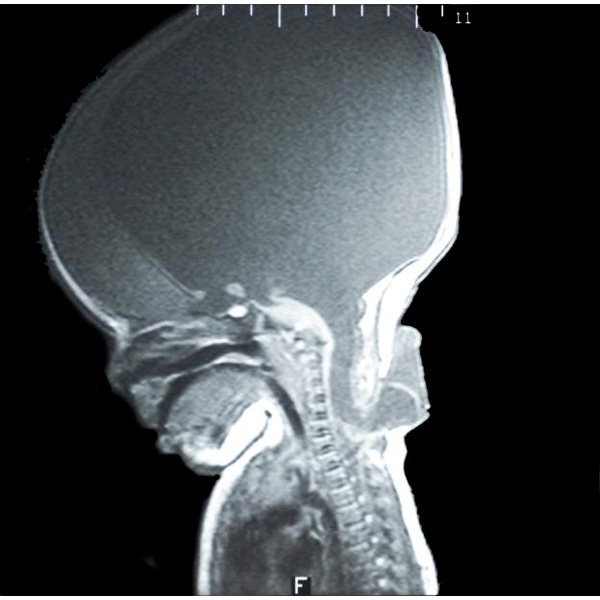 Hydrocephalus risk: Patients should be monitored closely for the development of hydrocephalus after encephalocele repair. Treatment of associated hydrocephalus key: If there is viable neural tissue in the encephalocele preventing immediate closure, CSF diversion can facilitate regression of the tissue into the cervical spinal canal and enable delayed closure.